Skittles' Place: I'm A Queen! I'm a queen! Or at least Misty thinks so because she gave me this award. I don't always believe things she says though because her thoughts have been corrupted by three pigs. One that left paw prints on her. One that shakes and oinks in a bag. And another "imaginary" pig she claims visits her from time to time. In an RC helicopter. So, I send Misty a big thank you (and slip a couple Xanax in her Dr. Pepper). Who can I pass this on to?? Hmm.. thinking... OH *light bulb* I know!!!! Lisa from Life is like a box of Legos. She doesn't post very often but anyone who has Legos in their blog name is way cool! Autumn from Random Autumness is one of my bestest friends. Her posts are always full of REAL LIFE.. and Dave Matthews. Grace from Doing The Math.. is a wonderful lady. Her posts are always terrific. I wish more people would visit her and find this out. For these reasons and more, I think all these women are Queens!!! What is with the pigs??? You 'splained the pigs?!?! The pigs are BEYOND 'splanation! Geesh. Pigs are evil, Robyn... that's all you need to know... 'cept for the one in the 'copter. Sometimes the one in the 'Copter can be evil too. Mostly to rat dogs..
Wow... I think I'm going to have to digest this later today... when I'm not at work... I have dancing singing things running around in my head right now. you are too kind! ! ! Erika: How could I NOT think of you! Your a queen every day. Autumn: You deserve this and so much more! 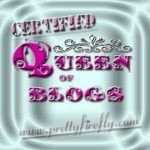 You are the queen of the blogs! And thanks for leaving such inspirationall comments on my blog. You have no idea how much it means to me. you ARE a queen Skittles! Congrats on a well deserved award! That you invented hoT is so impressive! I would love to hear how u were inspired for that? !